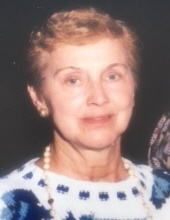 NONA MAE KOHLAS (nee Marquardt), age 87. Beloved wife of the late Robert S. Kohlas. Loving mother of Kimberly Fedor, and Mark Kohlas (deceased) (Kim). Dear grandmother of Matthew and Christopher Fedor, Justin Kohlas, and Jenna Angeloff. Sister of the late Robert and William Marquardt. Funeral Service will be held in the McGORRAY-HANNA FUNERAL HOME OF WESTLAKE 25620 CENTER RIDGE RD. (WEST OF COLUMBIA) Saturday February 9, at 11:30 AM. Interment Woodvale Cemetery. In lieu of flowers family suggest contributions to American Kidney Foundation at www.kidney.org. "Email Address" would like to share the life celebration of NONA MAE KOHLAS. Click on the "link" to go to share a favorite memory or leave a condolence message for the family.